With FileVault you can encrypt whole volumes of your computer, not only individual files, so if someone gets hold of the device, they won’t be able to access the stored data. They won’t even know what files you have. ou need OS X or newer in order to use FileVault. 1. 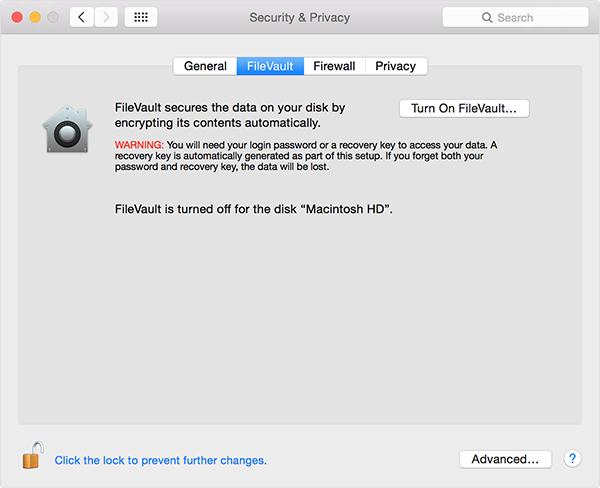 The first time your launch your Mac, it may ask whether you want to activate FileVault. You can check its status under System Preferences – Security & Privacy. 2. If it is not activated, you can turn it on by clicking on the lock icon, providing your administrator name and password and clicking “Turn On FileVault”.